Check out Tobi's Simone Tiered Ruffle Satin Crop Top Servin' up some serious flirty feels in the Simone Tiered Ruffle Satin Mint Crop Top. This cold shoulder crop top features stunning ruffles, v-neckline, front zipper, and open back. This party crop top will look beautiful with a bodycon mini skirt and heels! Servin' up some serious flirty feels in the Simone Tiered Ruffle Satin Mint Crop Top. 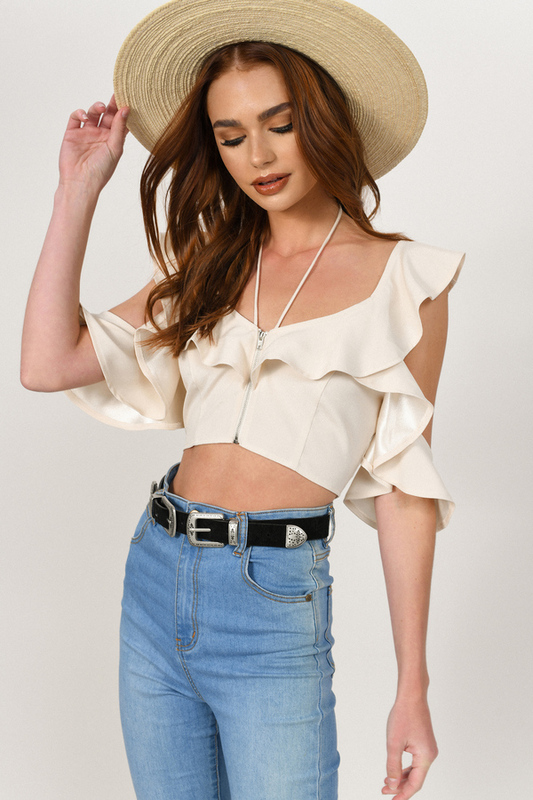 This cold shoulder crop top features stunning ruffles, v-neckline, front zipper, and open back. This party crop top will look beautiful with a bodycon mini skirt and heels! Servin' up some serious flirty feels in the Simone Tiered Ruffle Satin Ivory Crop Top. This cold shoulder crop top features stunning ruffles, v-neckline, front zipper, and open back. This party crop top will look beautiful with a bodycon mini skirt and heels!